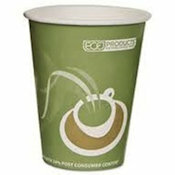 Eco Friendly PCF Hot Cups (50 Count). Made with 24% post-Consumer fiber these cups are a eco-conscious choice that does not compromise performance. We offer 2 different sizes, a 12 oz cup and 16 oz cup. Eco Friendly PCF Hot Cups (50 Count). Made with 24% post consumer fiber. Two sizes available, 12 oz and 16 oz.